illian H. Poole has a broad background in the development and management of non-profit institutions. She has served a wide range of non-profit organizations, and her experience also includes journalism, corporate government liaison and public relations. Since 1991 she has run The Fund for Arts and Culture, an all-volunteer organization which she founded in 1991 to help develop the potential of arts and cultural organizations in countries without access to best arts management practices, an experience that included recruiting over 100 senior managers in the arts to serve in over twenty countries. For almost twenty years she was responsible for planning and executing all the development programs of the John F. Kennedy Center for the Performing Arts, America’s National Cultural Center, a responsibility that ultimately included its partner The National Symphony Orchestra. Prior to that, she held similar positions at Washington National Cathedral and at the Corcoran Gallery of Art in Washington, D.C. She was Adjunct Professor of Arts Management in the graduate school of the American University for sixteen years. She has consulted for a variety of non-profit organizations including those in media and public service. 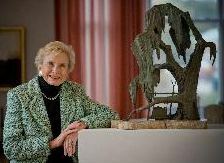 Her trusteeships included The North Carolina School for the Arts, The George Mason University Foundation, The National Building Museum, and theater, music and dance companies. She speaks French and Spanish, and her undergraduate degree in Diplomatic History is from George Washington University and she has an M.A. in English from George Mason University. She has received national awards in recognition to her service in the non-profit field.